"Spring Water, Flow Out! Hope,Flow out!" 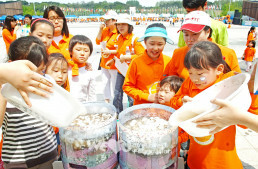 As the New Life Family Walkathon is held every year, children have grown mature in thinking. 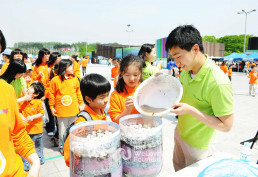 A 12-year-old boy said that he began to think more carefully about the poor neighbors around the world and the environmental problems as he attended this event with his family for many years.Like him, many children are learning the true meaning of “sharing” little by little while taking their steps forward one by one with their families at the walkathon. 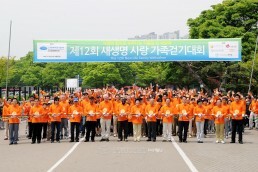 ON May 9,Sunday, “The 12th New Life Family Walkathon” was held in the Seoul Olympic Park. It was held by the Intl. WeLoveU Foundation and sponsored by Ministry of Health&Welfare, Sejong General Hospital, Korea Youth Services Center, Maeil Kyeongje TV and by Daejayon [The Internaional Association of University Students for Environmental Movement]. This event was held to provide clean water with water pumpS to five Asian and African countries which suffer from water shortages and the lack of clean drinking water. The aid project with the water pump began from the 10th New Life Family Walkathon in 2008 and has been actively progressing in many countries such as Ghana, Kenya, the Democratic Republic of the Congo, Cambodia, Laos and etc., and now it is providing high-quality water and substantial aid to tens of thousands of residents in those countries. On a sunny and bright day, the members of the WeLoveU Foundation prepared mats and lunch and gathered in the square of the park early in the morning. Along with about 10,000 members,the event was attended by the Intl.WeLoveU Foundation Chairwoman Zahng Gil-jah,who hosted the event, Chief Director Lee Gang-min and other directors, Sponsor Chairman Lee Sun-jae, PR Ambassador Kim Seong-hwan and some other goodwill ambassadors, and also by the embassy officials from Ghana embassy, Cambodia embassy and etc., and also many guests attended,like Harry van Woerden the Executive Director of Netherlands Foreign Investment Agency,Lee Bae-gun the Director of the Korea Youth Services Center, Park Yeong-gwan the President of Sejong General Hospital and etc. The attencants in orange-colored T-shirts filled the Peace Square. At about 10:30am,starting with a cute dance of the New Life Children’s Choir, the attendants were entertained by the singers like Kim Seong-hwan, Kim Bo-seong, Yun Tae-gyu, Lee Seung-hun, Baek Mi-hyeon,Kim Min-gyu, Kim Jae-hun and etc. As the last performance, the children of the embassy officials sang a song “Heal the world.” Through the song, they left a great impression and a strong message to heal the world in pain with our love and care coming from the bottom of our hearts. The video, which was played just before the celebration performances ended, helped the shortages and how much aid the WeLoveU Foundation is providing them. Some messages of thanks were delivered by the attendants from some countries which had been supported through the “water pumps of love,” Ghana’s Minister Counsellor C.Mintah-Agyemang and Nguon Socheath the councilor of the Cambodia Embassy appreciated the WeLoveU Foundation for having suppored the residents in poor areas with clean and safe water through the humanitarian activities and the water pump. They also expressed their wish for the Foundation to continue to give hope and share love with people in need around the world and realize the love for mankind by giving more people life and hope through more activities. The event continued with the Pump Donation Ceremony to aid five countries-Ghana,Kenya, Cambodia, Indonesia and Laos. The 1st part of the event ended by the attendants’trying out the pumps. Right after that, the 2nd part of the event, the walkathon, began after a brief warm-up. About 10,000 attendants began to fill the walking path full of fresh fragrance from all kinds of plants, flowers and trees. Some citizens, who had come out on a picnic with their families,heard the purpose of the walkathon, which is to help neighbors, and they waved and gave a big applause to the members. The faces of the children,who had come with their moms and dads were full of happy smiles.The adults were also happy to be able to participate in helping neighbors and also for the fact their children would be able to learn to think about others and to help their neighbors in need. The members who finished the Walkathon had a great time with their families here and there in the park. 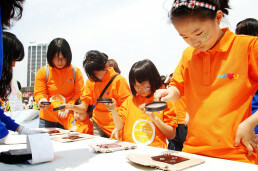 To help the children understand environmental problems, in the square many different events were prepared such as Water Photo Gallery,Energy Save Theme Park, Messages of Hope, Signing with the Palms of the Hands, Drawing Pictures of Nature, Making Slogans, Photo Contest,etc. At the booth which was set up to experience a water pump, many children gathered and touched the pumps with curious eyes, and clean water kept flowing out on the edges of their children’s fingers. The notice board was filled with memos like “My friends in Africa,cheer up!” ” I will try to save water now,” and with signatures of the palms of the hands; they were showing the beautiful future that our children are going to make.